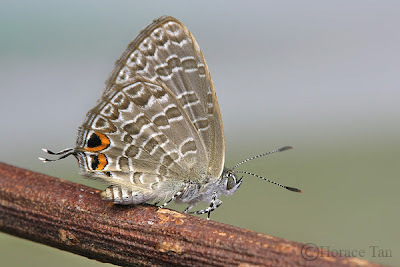 Above, the male is dull blue with two black and subequal tornal spots on the hindwing. 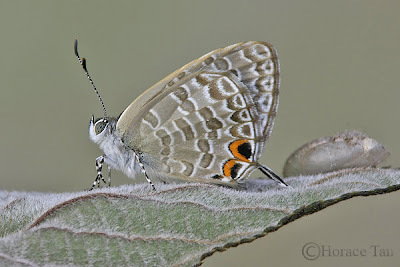 The female is fuscous black with basal parts shot with iridescent blue on the forewing and duller blue on the hindwing, and it has black submarginal spots on the hindwing with those spots in spaces 1b and 2 crowned with orange. Underneath, the dark interneural submarginal spots on the hindwing are separated from the rest of the wing by a narrow lunulate line, and the orange areas crowning the large dark subequal spots in spaces 1b and 2 are inwardly defined by a narrow dark line. There is a pair of white-tipped tails at the end of vein 2 on the hindwings. Another Ancyra Blue ready to take flight under the hot midday sun. 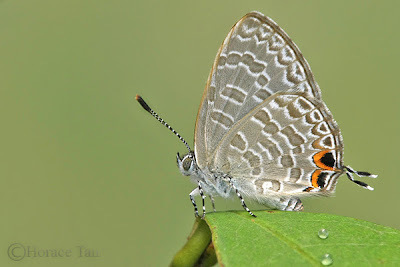 This species was not recorded as being extant in Singapore by early researchers. 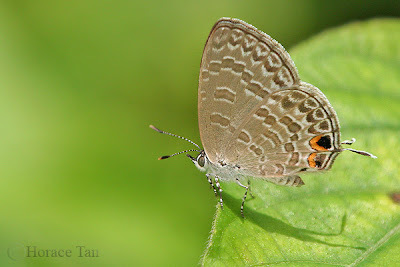 It was first sighted in 2004 in Pulau Ubin by ButterflyCircle members, and since then, sightings have been made at multiple locations on the Singapore main island, including the Central Catchment Reserves, the Southern Ridges and western areas of Singapore, where the host plants are found to be thriving. Typically, a small colony of the adults can be found in one location. Encounters with the adults usually take place in brightly-lit condition with them engaging in activities such as sunbathing, dog-fighting or making oviposition visits to the host plants. Outside Singapore, recorded host plants are found in the plant families Urticaceae, Fabaceae (Caesalpiniaceae) and Euphorbiaceae. 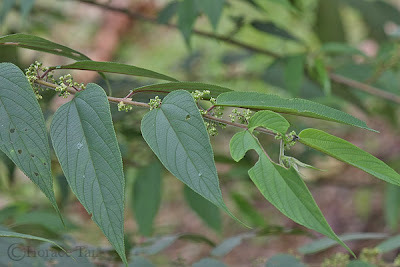 The local host plants recorded todate are Pipturus argenteus (Urticaceae) and Trema tomentosa (Ulmaceae), the latter being a new addition attributed to Sunny Chir, an active ButterflyCircle member, who sighted a small colony with females ovipositing on the host plant in an urban park. According to Prof. Konrad Fiedler, this is the first confirmed record of Trema-feeding in C. ancyra. Trema tomentosa is a shrub or small tree with ovate or ovate-elliptic leaves of length 8-15cm. The acuminate leaves are toothed and three-nerved from the base with undersides covered in tiny silvery hairs. Though not common locally, this plant can be found in various waste grounds such as the abandoned farmland in the west, the Central Catchment Nature Reserve and the Southern Ridges. 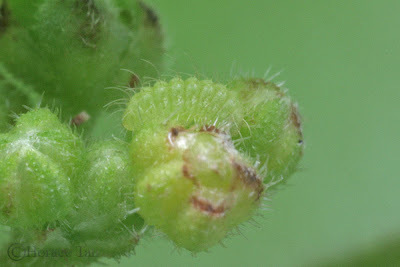 The early stages of the Ancyra Blue mainly feed on the flower buds. However, when flower buds are in short supply, the caterpillars have been observed to munch on young leaf shoots. 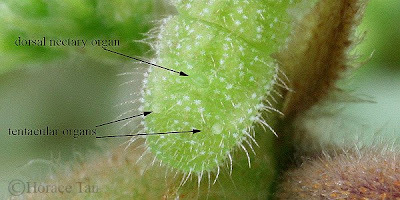 Furthermore, the final instar caterpillar has no trouble dealing with the tougher lamina of mature leaves. The host plant, Trema tomentosa. 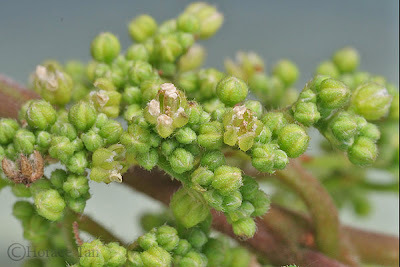 Clusters of flower buds of Trema tomentosa. 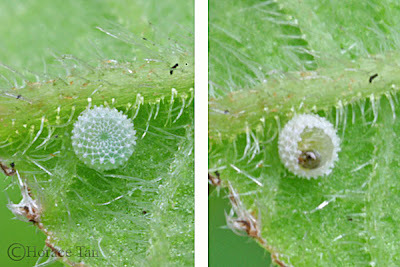 Eggs of Ancyra Blue are laid singly on the underside of a leaf. The egg is small (about 0.4-0.5mm in diameter) and light green in colour, circular with a slightly depressed micropylar area and a reticulated pattern of intersecting ridges. Left: an egg of the Ancyra Blue, diameter: 0.4mm-0.5mm. Right: ready for hatching. An animated hatching sequence of an Ancyra Blue caterpillar. The actual process lasts about 2 minutes. 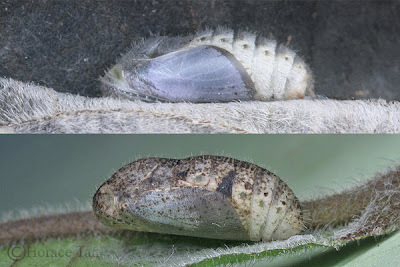 Two to three days later, hatching takes place after the young caterpillar has nibbled away sufficiently large upper portion of the egg shell to emerge. Measured at a length of about 0.8mm-0.9mm, its pale yellow body is cylindrical in shape, sporting long setae (hairs) and a dark brown head capsule. The 1st instar caterpillar finds its way from the leaf underside to a nearby cluster of flower buds to start its feeding frenzy. As it feeds and grows, it gradually takes on a yellowish to light greenish coloration. After about 3 days of growth and reaching a length of about 2mm, the caterpillar moults to the next instar. 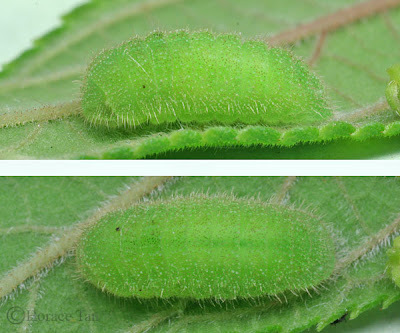 The 2nd instar caterpillar has numerous short setae covering its body which has taken on a woodlouse shape. The body is yellowish green overall with the head capsule now in pale yellow. 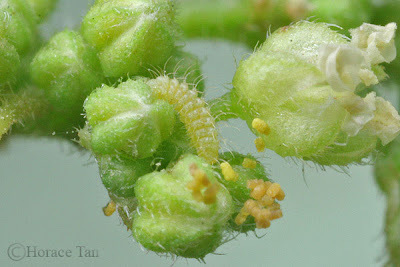 The 2nd instar caterpillar reaches a length of about 4mm, and after 2-3 days in this stage, it moults again. 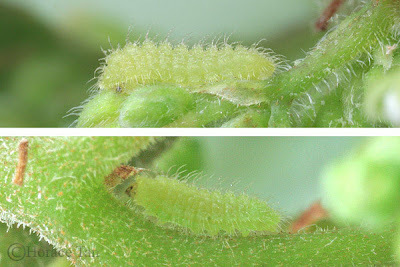 The 3rd instar caterpillar has proportionately shorter but still numerous body hairs, a green body color and a wider body compared to the earlier instars. This instar takes 3 days to complete with the body length reaching about 5.5mm. 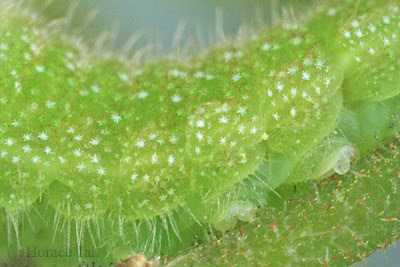 The 4th (and final) instar caterpillar is more striking in general appearance as there are a fair number of prominent white specks doting the green body surface, in addition to other smaller brown specks which are less discernible. Zooming in on these specks, one could see that they occur at the base of setae and have an "asterisk" structure. These structures could serve as mechano-receptors or might be glandular in nature. At a larger scale, the typical lycaenid nectary organs (both the dorsal nectary organ on the 7th abdominal segment and tentacular organs on the 8th abdominal segment) are now distinguishable. Lengths as stated in the pictures. 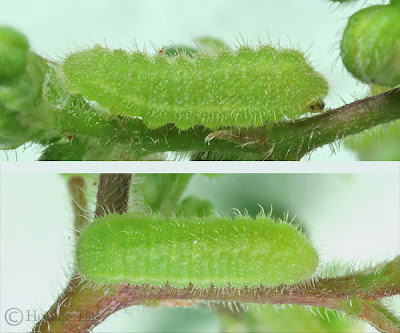 The white "asterisk" structures at base of setae on the body of a 4th instar caterpillar. A 4th instar caterpillar showing the presence of the dorsal nectary organ and tentacular organs. 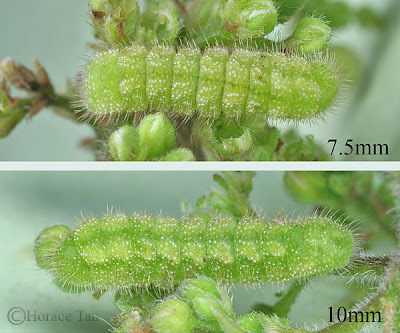 After 5 days of growth and reaching a maximum length of around 12mm in the final instar, the body of the caterpillar gradually shrinks. Soon the caterpillar seeks out a spot on the surface of an adjacent leaf to station itself. At this site, it enters the pre-pupatory phase where it readies itself for pupation by spinning a silk girdle and a silk pad. The caterpillar secures itself to the silk pad via claspers on its posterior end. An animated pupation sequence for an Ancyra Blue caterpillar. Pupation takes place after 1 to 1.5 days of the pre-pupal stage. The pupa has the typical shape for most Lycaenid species. It is greenish in color with a few brown and black specks scattered on the surface. The pupa has a length of about 7-8mm. 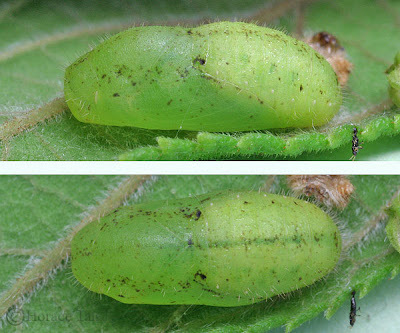 Two views of a fresh pupa of the Ancyra Blue. 5 to 5.5 days later, the pupa becomes darkened in color signaling the imminent emergence of the adult. The next day the adult butterfly emerges from the mature pupa in the morning hours. Out of a group of 8 adults successfully bred in the last month, 3 were male and the rest female. 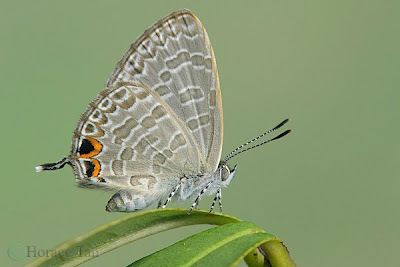 the forewing uppersides are different for the two sexes. A newly eclosed Ancyra Blue resting next to its pupal case. I would like to express my gratitude to Prof. Konrad Fiedler for his generous advice on host plant information for the Catopyrops spp. and the functions of the "asterisk" structures found on the body surface of the mature larvae.